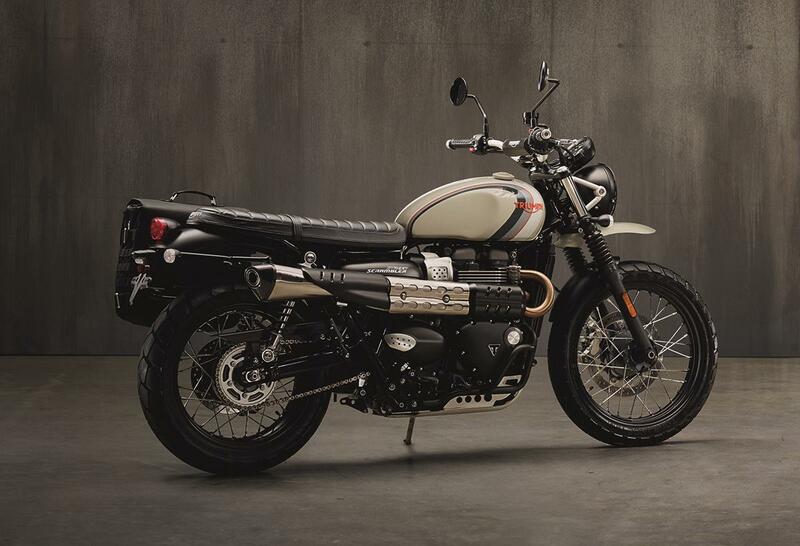 The Triumph Street Scrambler benefits from a rather decent hike in performance for 2019, much like the new Street Twin, both unveiled at Intermot 2018. After being originally launched in 2017, the Street Scrambler now gets a new Brembo 4-piston calipers for added bite and power, and a higher calibre of cartridge fork for improved composure from the front end. Hardware aside, there are new Road and Rain riding modes to give riders a little more assistance at the throttle when the going gets changeable, and even a tyre pressure monitoring system as an optional extra. Peak power has also increased by 18%, along with a 500rpm higher red-line of 7500rpm. Switchable traction control, ABS (the Scrambler’s is switchable for dirt forays) comes as standard fare. Other standard equipment includes the ’torque assist’ clutch that results in a lighter lever, but with more positive feel, immobiliser, LED rear light and USB charging socket. Other mechanical tweaks include a new magnesium cam cover, lightweight crankshaft, dead shafts and balance shafts. The Scrambler gets some plastic surgery too, with new number-board panels and graphics, new seat cover finish, a clock upgrade, and wider spaced forks for a more rugged adventure bike look. The impressively spaced service intervals, at 10,000 miles, also helps to keep maintenance costs down. As part of a range of over 120 new accessories, an Urban Tracker inspiration kit will be available, comprising: 25l pannier and mounting kit, Vance & Hines silencer, CNC black oil filler cap, black handlebar brace, number board kit, black bench seat and dresser bar kit, headlamp grille and bezel, high lever front mudguard and a sump guard kit.